叉燒肉 -- Don't forget the sauce! What kind of image does the word "Chinatown" conjure up? Well, besides the crowd and less-than-clean sidewalks, I think of tightly neighboring storefronts with large panes of glass behind which roasted ducks, BBQ pork, and marinated chickens are hung side by side. Yes, the three treasures, as the Cantonese restaurants call them. Most people are fooled by the three treasures served in many Chinatown restaurants -- they only get the duck, pork, and a sunny-side-up egg. The three treasures were my introduction to Cantonese cuisine, even before my dim sum days. I remember I didn't like the duck very much; I usually just ate the chicken and pork. I especially liked the sweet glazed pork with a shockingly red color. That is my favorite. 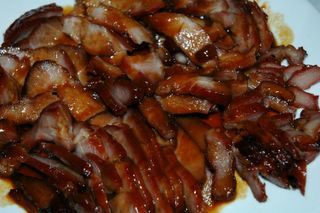 Since I started cooking regularly, BBQ pork has made its way into my repertoire. This is my stand-by recipe. I've made it so many times I don't even need to think much when I make this. This may not be as good as the Cha-siu one can buy in the restaurant, but it's good enough to be comfort food. Usually I make vegetable-rice to go with it. (Basically it is my mom's variation on the classic Shanghai veggie-rice. Simply stir fry up some bok choy with quite a bit of oil and then mix with cooked rice) You can also serve it over plain rice with lightly-boiled Chinese broccoli (Gai-lan). Better yet, serve over noodles in chicken soup also with some lightly boiled Chinese broccoli. 1. Hanging the pork makes the pork color correctly on all sides. It also drains away more fat. 2. Resting the meat is important. Slicing while pork is still hot from the oven will make it lose more juice. 3. After the pork and the marinade are placed in a freezer bag, they can be frozen for a long period of time. Make sure the meat is flat and evenly distributed in the bag so it thaws quickly when needed. 2. Mix the rest of the ingredients well. Add this mixture along with the pork into a freezer bag. Marinate overnight in the fridge. Make sure all sides of the meat are well coated. 3. Preheat oven to 350F. See pictures below to roast the pork in hanging position. Roast for 40 minutes. 4. Meanwhile, boil the leftover marinade. Add water or seasonings to taste. If desired, thicken with corn starch. Be careful, the high amount of sugar makes this sauce easily burned! 5. Let pork rest for 10 minutes before slicing thinly against the grain. 6. Serve slices with sauce. Yeah the fat is good. I think this is what we call "梅花肉" -- there's plenty of fat! I love 梅花肉, they make the best Cha Shao! And I love the Shanghainese veggie rice, I have not had any since I got on this stupid south beach diet, oh how I miss veggie rice! You site have something special I like. Impressive your site appreciate thank you for you suggestion.